Here's a guide to Cybertech based on my experience in-game to date. All information is current as of 23 July 2012. Tooltips for Underworld Trading missions have been updated to reliably inform the player about expected yields. Cybertech is a Crafting Crew Skill that allows you to create Armoring, Mods, Earpieces, Droid Parts, Ship Upgrades, Personal Vehicles, and Grenades. Cybertechs can create 5 unique, artifact quality grenades that are more powerful than ordinary grenades and are not expended when used. They share a 3 minute cooldown and, in my experience, find their best use in PVP. That said, additional damage without a resource cost is always welcome in any setting, and there are numerous effects that these grenades can generate that are useful in an Operation setting, particularly when there are groups of non-boss enemies involved. Which Advanced Classes benefit from Cybertech? All Advanced Classes benefit from Cybertech. What other Crew Skills should I take? For the serious crafter, Scavenging and Underworld Trading are absolutely required. Unless you have an exceedingly rich main character, and don't mind waiting for materials to become available on the GTN, these two crew skills are vital. Scavenging will allow you to gather all the materials required to create Green items, including missions for the materials that you can buy from the Crew Skill Vendor. These materials are FAR cheaper to attain using the missions than the crew skill vendor, particularly at higher levels. Underworld Trading allows you to gather additional components that are required to create blue and purple items. These materials cannot be gathered in the open world, they must be acquired by running missions. This causes them to sell for a significant sum on the GTN. What else should I know about SWTOR crafting and equipment before learning more about Cybertech? Crafters may only create Green (Premium), Blue (Prototype), Orange (Prototype but modable) and Purple (Artifact) gear. This may change as more Operation level schematics are introduced. In some cases these colors MAY appear different, as I'll demonstrate later on, but the exceptions will most likely be altered to reflect this color scheme in future patches. Orange modable gear is very important to crafters, as all the stats on the equipment are determined by equipment modifiers, such as the armoring and mods made by Cybertechs. Orange armor takes both the armoring and mods, while weapons take only the mods. The remaining slots in armor and weapons are enhancements, color crystals, weapon hilts and weapon barrels, which are created by Artificers and Armstechs. The total stats on an Orange item are added together above all the item equipment slots. This can confuse people who are new to the game. Don't make the mistake of adding all the individual stats from the mods to the total listed above them. Artifact gear often has item slots for armoring, mods and enhancements, depending on the equipment slot in question (artifact belts and wrists have no slots at all, only stats. Orange belts & wrists only take armoring and mods). Similarly, some artifact weapons have no item modification slots at all, while others are completely modable. All classes, as early as level 14, can now acquire a great deal of Orange modable armor via the Social Vendors on planets or the CE vendor. All social armor now automatically upgrades to the highest type of armor wearable by a character (light medium or heavy). Reverse Engineering (RE) is a small hammer-like icon above your inventory. Many of the items you create (or find) can be broken down by clicking on the "hammer" and then right clicking the item you wish to break down. Breaking down an item returns a portion of the materials used to create it and offers a chance to learn a new schematic of higher quality. New schematics have the same level requirement for the item, but are superior in quality. I highly recommend reading the "Reverse Engineering Sticky". There is a lot of excellent information including charts that explain in detail all the nuances of Reverse Engineering. I do not believe that crafters can learn any higher than artifact quality schematics at this time, but will gladly accept proof to the contrary. I highly recommend breaking down most of what you create while leveling your Cybertech in order to gain new schematics and more materials. This will allow you to level up your crafting skill faster, and give you more schematics from which to craft sellable items for the GTN. Crafting only green items will also level you quickly, as they take much less time and fewer materials to create. That said, crafting skills can be expensive to level. Don't be afraid to see if some of your creations can be sold on the GTN (Galactic Trade Network) as you level your profession. You will recover your relatively expensive deposit if the item does not sell, and if it does sell, most of that deposit is returned to you. Removing an item from the GTN early forfeits your deposit. Augment Slots: Augment slots are created on crafted items when the crafter crits. All items worn may now be given an augment slot, even the "Matrix" relic created using color crystals found in datacrons. Artifact level components for augments come from Slicing, which are then used by Armormechs, Armstechs and Synthweavers to craft augments. Augments have up to 18 of a primary or secondary stat, and up to 12 endurance. That number is from a 50 rating artifact quality augment. Augment slots created via a crafting critical success will only take augments in the same level range as the crafted item. Augment slots may also be added using augment slot kits created by armormechs, armstechs and synthweavers. These slots may be added to any item, including relics, off hands, etc. The cost of adding an augment slot to an item is 30k, plus whatever you paid for the augment kit (roughly 40k on my server for a mk-6 kit that can take the highest level augments in the game). Augment slot kits range from mk-1 to mk-6. Each subsequent kit allows for higher level augments to be placed in the slot. Regardless of the slot on the item, players are restricted in what augments they can use according to their level. The difficulty of crafting an item is directly proportionate to the likelihood of you gaining a skill point in that crew skill. Go here for an easy to read list of all companions and their crafting bonuses, sorted by class. 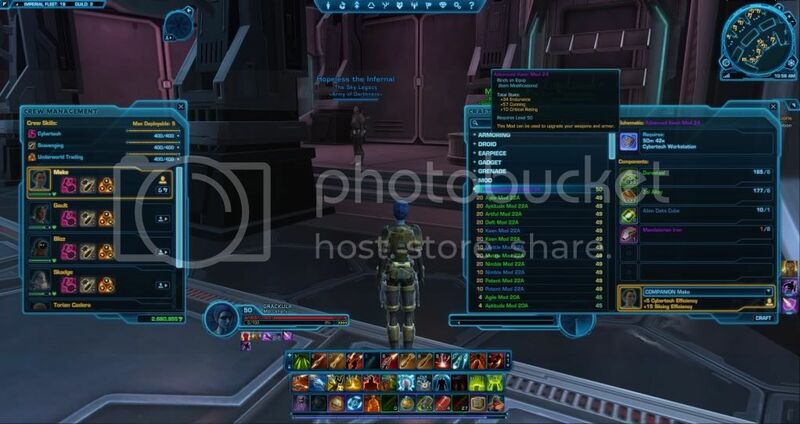 This information has been provided by the SWTOR forums poster CopperHamster. Cybertechs can create Item Modifiers called Armoring. These are placed into modable equipment. Armoring is the sole component that determines the actual value of your armor, and thus is the most important item enhancement that can be placed in armor, particularly for those who wish to tank in Operations. Armoring include an armor rating, a primary stat and endurance. Armor rating determines the armor on an item, which is modified according to the item's property of light, medium or heavy. Heavy armor will gain more armor than medium armor will from Armoring with the same armor rating. At early levels, the primary stat on Armoring will always be higher than the endurance. Once you can create armoring that requires level 33 or higher to use, you will gain access to four new schematics for armoring that grant more endurance and less of your primary stat. These are useful for tanks, or possibly for PVP, though I personally would still use the higher primary stat for PVP gear unless survival was more important than damage or healing (such as in Huttball). At end game, armoring can be found in weapons and armor and from daily/black hole commendation vendors that exceeds anything that a Cybertech can create. I wouldn't bother spending too much time researching the vendor purchased schematics to artifact level until you have no other use for the Ciridium (blue grade 6 Underworld Trading material) that is required for researching Cybertech high level schematics. Blue and Purple Low Level Armoring (levels 13-47) sell well because they cost a lot of world commendations and thus are far more expensive for most players to purchase than mods or enhancements. As many level 50 players are leveling alts and have a decent amount of cast, most of these armorings can fetch between 10k and 20k on the GTN, depending on the market competition. Vendor Schematic Armoring can only be reverse engineered up to Artifact quality armoring with the prefix "Advanced". Unconfirmed: Black Hole level armoring can be reverse engineered but only from armoring drops. Armoring found in BH vendor gear cannot be RE'd. Schematics for armoring (type 24) have been reported to drop in story mode EV and KP operations. This may simply be a new, very rare, world drop from high level creatures. Cybertechs can create a variety of droid parts. Although all the end game droid parts are for tanking (ie, for the companion droid tanks in the game), there are a number of schematics that can be created early on that are fully modable. These droid components are green, despite being fully modable. These droid components can be sold, and are particularly useful if you are playing a class that doesn't receive any other healer companions early on in the game, since all ship droids can be used to heal. Droid Components are the only artifact quality item for Cybertechs that uses a Tier 1 Prefix. Tier 1 Prefixes are Redoubt, Overkill and Critical. See Earpieces for a list of all the Tier 2 Prefixes. What this means is that there is an additional stage to Reverse Engineering for droid components. When you Reverse Engineer Prototype (blue) droid components, they will give you Artifact (purple) schematics but with a Tier 1 prefix. You may then create and RE the artifact quality Tier 1 components to learn new schematics with the Tier 2 prefixes that are listed below. The Tier 1 prefix is used to determine which of the Tier 2 prefixes can be learned. I have yet to see any droid components that are superior to the Tier 2 crafted droid parts. Whether or not you can make a profit will be determined by the amount of people who are willing to spend a LOT of money on gearing up their tank droid companion. Since the RE process to learn these schematics is EXTREMELY expensive, you should probably not spend time trying to learn the Tier 2 schematics until you are very comfortable financially. I expect that it will cost me several million credits to RE the four max level artifact Tier 2 quality droid parts, given that the materials for each RE'd component costs me 30k or more on the GTN. The Veracity Tier 2 Prefix for Droid Components only adds 27 Shield rating to the value of the Tier 1 schematic. Thus, for example, the Hawkeye Tier 2 prefix, which is derived from an Overkill Tier 1 prefix, will add a total of +24 Power and +27 Accuracy to the base prototype (blue) droid component. With artifact earpieces, the value of the Tier 2 prefix is +40 to each stat. This is where I have made my credits in the game. Earpieces are relatively rare drops throughout the game, and thus a good way to make credits virtually every step of the way. The highest trainer taught earpieces are equipable at level 49, and the artifact versions are easily comparable if not superior to tionese or columi earpieces. Artifact (Purple) Schematics replace the blue items prefix, removes the blue item's bonus stats and adds another 40 to the Tier 1 stat and one other stat. There are a LOT of purple schematics, and it's important to understand how stats affect you in game in order to create earpieces that people will actually buy. Reverse engineering is fairly random, so you will likely receive just as many if not more "bad" prefixes as good. I have underlined the prefixes that I consider useful. That said, how the prefix combines with the base earpiece is also very important. For example, there are only three earpieces that are ideal to RE to the prefix Veracity. If you want to create a good tanking earpiece for a Bounty Hunter, for example, then you would reverse engineer the green Galactic Combat Module earpiece until you received the schematic for Redoubt Galactic Combat Module. You would then reverse that blue earpiece until you received the schematic for Veracity Galactic Combat Module. It is important to keep in mind the stats that you feel a class would like. Since the primary purchasers of your earpiece are likely going to be those who want them for Hard Mode flash points and Operations, Presence is a useless stat. It only affects your companion's damage, and they cannot be used in either of those locations. Therefore, refrain from trying to create and sell any of the earpieces with presence on them. You would likely just be wasting your time. Altogether, I have 30+ max level artifact schematics for earpieces, and only a few of those still sell well. Since I was the first Cybertech on my server to research most of these schematics, I have been able to recover the significant expenditure of time and credits spent getting my Cybertech to this point. You may or may not find this aspect of Cybertech as lucrative as I have, but it may be worth investigating. Check the GTN to see which classes or roles are lacking for earpieces, and then try to fill that gap. There are three schematics for gadgets at this time. All of them are personal vehicles and all of them are now bind on equip, meaning that you can trade or sell them. They don't save you much in terms of credits, since the cost of the materials is similar to the cost of a new speeder, with the possible exception of the level 40 speeder. The level 25 speeder is a tan reskin of the boxy looking speeder available on Tatooine. UGLY. Not worth it. The level 40 speeder is actually nice looking. I recommend making this one for personal use. The level 50 speeder is a red reskin of the level 40 version. Not a bad bike, but I prefer the Gurian Shadow, so I rarely use this one. You cannot Reverse Engineer speeders. Grenades are consumeables that only have a level requirement. There are various types of grenades, and I suspect that serious PVPers and Ops teams may purchase these for that extra edge. However, I have not tried to sell any and couldn't say whether or not they are worth the cost of the materials. As a Cybertech, you also purchase schematics from the trainer for bind on pickup artifact quality grenades that are superior in damage and effect durations, and not consumed on use. I now have all 5 grenades created, and I love them. They are great for slowing down or outright stopping a group of enemies, such as the opposing huttball team that is closing in on your ball carrier. You will need a special component to create these, Biometric Crystal Alloy, that only drops off of Hard Mode Flashpoint bosses and Operation Bosses. You cannot Reverse Engineer grenades. Mods are very similar to Armoring, except that they can also be placed in weapons, and do not affect the armor rating of armor. Cybertechs cannot create tank specific Mods. In addition, the highest mods created are equal to those found in certain daily heroic quests at level 50, and inferior to those found in PVP and Operations gear. For Mods that require greater than level 22 to use, Cybertechs can only create ones that end with the suffix A (as opposed to no suffix, or the B suffix), or those that they have successfully reverse engineered from Operations gear (Black Hole). Cybertech can create Aptitude Mod 22A. Cybertech cannot create Aptitude Mod 22 or 22B. Schematics for Mods higher than 22 (ie Advanced Keen Mod 24, as shown in this link provided by The_Duck http://i178.photobucket.com/albums/w...een_mod_24.jpg ) have now been confirmed to drop from story mode KP and EV operations. This may simply be a new, very rare, world drop from high level creatures. Cybertech is the only crew skill that can create components for spacecraft. These components are superior to anything that can be bought from the starship vendor or earned through space quests. The schematics for these prototype and artifact components can easily be found on the GTN or from slicing. The crew skill trainer does not provide you with schematics for space. The schematics are quite common though, so don't spend your life savings purchasing them. Since the "space game" isn't much more than a mini-game, you probably won't be able to sell these components for outrageous prices, though they still sell well since Cybertechs are the sole source. You cannot Reverse Engineer spaceship components. For the purpose of this guide, when I mention the "cost of an item" I am referring to the amount of credits you would receive for an item if you simply sold the materials used to create it on the GTN. Obviously this can differ from server to server, but I will share my impressions nonetheless. Although Cybertech was initially a lucrative profession, there is now little demand for much of what it can make. Many items can only be sold for the value of the materials used to make them. With the introduction of easy to earn BH (Black Hole) earpieces and level 26 mods, there is little reason for max level characters to purchase non-BH items. I have learned one BH pattern from a RE'd BH earpiece out of the 10 or so REs I've done. This has allowed me to make decent money for our guild bank (using the mats from our Operations), but led to virtually no personal gain in credits. Low level mods, amoring and earpieces continue to sell quickly, but only for relatively low prices. They can be worth selling, but only if you don't mind spending a lot of time on the GTN figuring out which ones are being sold by other cybertechs on a regular basis (so you can find the unfulfilled niche). The speeders sell for roughly the price of the materials used to make them, or less. If prices for the materials on the GTN exceed the price I can get for the item, it's not really worth my time to make the item unless the odd critical duplicate is significant enough to easily make up for the cost. Even at the cost of the materials I had a difficult time selling speeders since non-crafted speeders from the vendor are cheaper. Most of the expensive items I can make do not create duplicates, but rather add an augment slot, which ends up being far less valuable, especially on sub 47 items. Since the value of an augment slot on a BH earpiece is now negligible next to the cost of the item itself (perhaps 70k on a 1 million credit item), and market values can easily sway more than that, crits have become far less important than in pre 1.3 when I could sell an augmented BH earpiece for 2 million credits the same day it was placed on the GTN. Since, after some quick mental math, I can sell the materials used to create a BH earpiece for roughly 1 million credits, it's hardly worth it for me to craft the earpieces, even if every single one crit. Non-BH earpieces tend to sell for 20k-50k. The only ones really worth selling at this point are good veracity earpieces since they have better defensive stats than Rakata (though far less endurance). If you can't sell them for more than 30k, you're probably wasting your time. Droid Components are selling (for me) at 1 every day or so at 75k to 100k each for the highest level Redoubt pieces. I have a Tier 2 Veracity piece, but it takes 8 Mandalorian Iron to make, and I suspect that it will sit and rot if I try to mark it up for a decent profit over the cost of the mats on the GTN (ie. 160k+). Still, I may risk one and see if someone will pick it up. Augments from crit crafting are great since the item is level 47 (and thus receives the highest augment slot) and the value of the item is similar to the cost of placing a kit in it, thus increasing the selling price by 50% to 75%. Space ship parts sell fairly quickly, but it's rare that you can sell them for better than cost. That said, this is one of the few 20k+ credit items that you can crit craft duplicates on, so it can slowly but surely make you some money. If all the artifact quality spaceship parts are selling for the same, stick with the Quellegh and Hoersch parts, since they only require grade 5 underworld material. I haven't tried selling grenades. I'll have to check the GTN in the near future to see what they're selling for, now that the amount of grenades created doubles on a crit craft. Take everything I've said with a grain of salt, as there aren't many professions making money hand over fist at the moment. Consumeables keep Biochem pretty high on the money making list, and Augments are decent coin for Synthweavers, Armstechs and Armormechs who have Slicing, but Cybertech is the only profession that hasn't received anything really new or exciting since release. Hopefully our time is coming soon. My Cybertech crew skill has 30+ maximum level RE'd artifact quality Earpiece schematics, all max level artifact quality Armoring schematics, all max level artifact quality Mod schematics, all Tier 1 prefix max level artifact droid components, all spaceship schematics and all gadget schematics. Here's a link to a Cheap & Fast guide for Cybertech Leveling if you're worried about cost more than utility and sales. Here's a Spreadsheet with good information on Cybertech schematics and material requirements, as provided by JoeDShadow. Excellent write up thanks for sharing it. Have you came across the Prototype Transport Beacon by any chance, i have not been able to find much information about it at all. I am a 400 Cybertech and I have been for some time. Early on my best seller has been spaceship upgrades, so I think you may have overlooked that portion. I recently got more competition, but for a while, I was selling 3 to 4 ship upgrades a day for 50K to 75K each. Due to competition, I am only selling 1 to 2 a day for 38K to 65K. I have about 6 of the epic earnings discovered, but I am continuing to discover more. I just listed a bunch for 55k, so we will see if they sell. My biggest issue is getting enough of the salvage metal and components. I sell the artifact earpieces I listed for 90k, and augmented versions for 190k. I sell roughly 3-4 per day. So far today I've sold one with an augment slot and two without. Since many of the starship upgrades use grade 5 rather than grade 6 underworld materials, it is indeed a good money maker. However, until recently I didn't have the spare missions to run anything but grade 6 missions. Whenever I didn't have enough grade 6 underworld missions for metals, I would send my companions out for grade 1 missions. This had a chance to cycle new grade 6 metal missions into the list, which I would then take. Feel free to add a link to the spreadsheet I'm working on as well if you like. Lot's of good stuff in there - much appreciated! In my days we fought elves and orcs, not space troopers. Now get off my lawn ..
Great information on cybertech. Some tidbits useful for other budding crafters as well. Nice post. I am making grade 2 space ship components and they sell very well on GTN for about 5k a piece. They are easy to make too, since you find Bronzit (or what ever) in heaps and heaps on Balmora in particular.